Seated yoga poses such as Easy pose and Half Lotus were invented thousands of years ago by monks who trained to endure long hours of sitting and meditating. Whether you start your day with meditation, or find a seated posture at the beginning of your yoga class, Easy pose and Half Lotus are bound to find a way into your practice. Although very similar, the two poses vary slightly in difficulty, with Half Lotus requiring open hips, flexible ankles, and mobile knees. So find a comfortable seat and follow along to experience the difference between Easy pose and Half Lotus pose. Traditionally, yoga classes begin and end in "comfortable seated position" with the most popular version being Easy pose. This cross-legged posture may come easily to some (hence the name), however, it can be challenging to maintain an upright posture through the spine for yogis with tight hips and back muscles—this usually results in hunching through the pose. Tips: Relax through the hip creases to ensure you aren’t clinching to keep the spine upright. Modifications: If Easy pose seems difficult, place a blanket, pillow, or some other prop under your seat to position the hips higher than the knees. This positioning will alleviate the tension in the hips, knees, and back allowing for better spinal alignment. The preparatory pose for Full Lotus pose, Half Lotus is an intermediate seated posture and a step up in difficulty from Easy pose. The pose requires more engagement from the hips, thighs, knees, and ankles due to the heightened elevation of one foot. Tips: With the top-crossed foot resting atop the opposite hip crease, the knee will gravitate below the foot which could be problematic for those susceptible to knee injury. To protect the knee, outwardly rotate the hip and thigh before placement of the top-crossed leg. Modifications: The knee is the body’s weakest joint, so use caution when entering and sustaining Half Lotus. If the hips are tight, the top knee will likely have trouble descending to the ground. To relieve pressure, bring a blanket or block under the knee of the top-crossed leg. In both poses, feel the support of the ground beneath you and appreciate the comfort of simplicity. Then extend through the crown of the head, and draw the shoulders back and down, further sculpting the position of the spine. 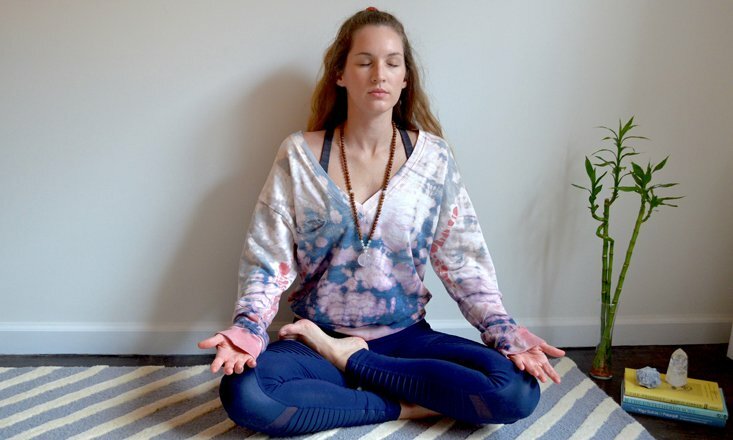 Easy pose and Half Lotus can be deeply calming poses, so settle in, remember to breathe deeply through the nose, and allow the mind to slip into a meditative state. Don’t forget to cross legs to the opposite positioning, spending the same length of time on both sides. Beyond relaxation, these seated poses will strengthen the back, improve everyday posture, and stretch the hips, knees, thighs, and ankles. Remember to use caution if you have knee or hip limitations.